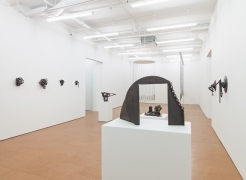 Alexander Gray Associates presented its second exhibition with Melvin Edwards, spanning the trajectory of Edwards’ nearly 50-year career. 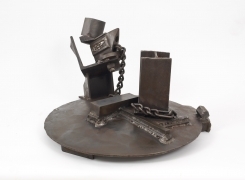 Concurrently, Edwards is a featured artist in the celebrated exhibition Now Dig This! 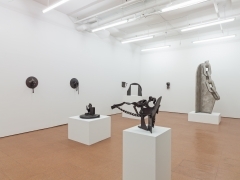 Art and Black Los Angeles 1960–1980 on view at MoMA/PS1, organized by Kellie Jones for the Hammer Museum, Los Angeles; the exhibition runs through March 11, 2013. 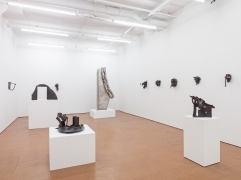 Edwards’ manipulation of industrial materials—and their cultural connotations—is emphasized with a selection of installations, wall reliefs, and free-standing steel sculptures on view. 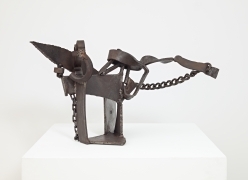 Chains are present throughout the works, reinforcing the relationship between material and image at the foundation of Edwards’ oeuvre. 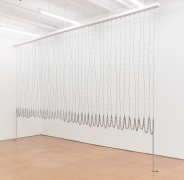 The duplicity of meaning inherent in the imagery of chain, a symbol of oppression yet also a metaphor for cultural linkage, lends complex narrative to the modernist forms. 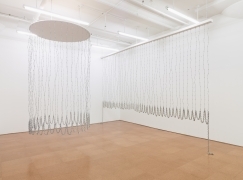 The exhibition centers on Edwards’ groundbreaking 1969–70 installation, Curtain for William and Peter (1969–1970), a drape of barbed wire hemmed with heavy-gauge chain. 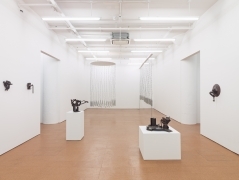 Included in the artist’s solo exhibition at the Whitney Museum of American Art in 1970, Curtain pays homage to fellow artists William T. Williams and Peter Bradley, utilizing materials of labor and entrapment to create an elegant, fluid form tinged with brutality. 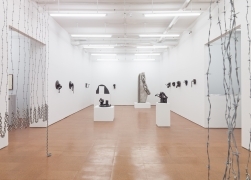 The iconic stainless-steel sculpture To Listen (1990) stands at nearly 8 feet tall, anchors a gallery of pedestal-scaled sculptures, dating from the early 1970s to the present. Also included in the exhibition are works from Edwards’ renowned Lynch Fragments series, spanning from the 1960s to 2012. 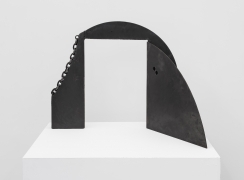 Among the disc-formed wall sculptures is the rare 1965 work, Texcali, which was included in Edwards’ 1965 solo exhibition at the Santa Barbara Museum of Art. I have always understood the brutalist connotations inherent in materials like barbed wire and links of chain and my creative thoughts have always anticipated the beauty of utilizing that necessary complexity which arises from the use of these materials in what could be called a straight formalist style.... Wire like most linear materials has a history both as an obstacle and enclosure but barbed wire has the added capacity of painfully dynamic and aggressive resistance if contacted unintelligently. 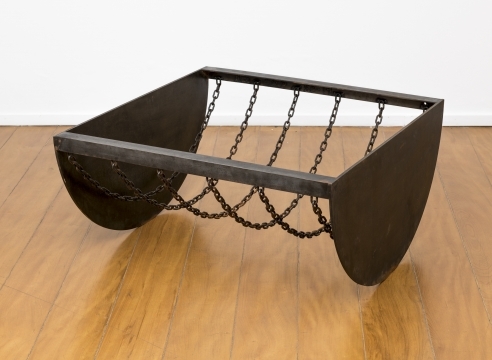 To use this chain with all its kinetic parts crisscrossing the line as invader and potent container.